My bff and I have an annual girls night out tradition. We take a girls-only staycation, eat out at a fancy-shmancy restaurant, sleep in the next morning, hit up the outlets, and last year we spontaneously joined a 5k after we ran into the racers at the hotel breakfast nook. The 5k is now part of the tradition. Last year at the restaurant we shared a beet salad and polenta fries. I am still trying to get my polenta fries to be the same perfectly pillowy creamy inside and crispy crunchy outside. But the salad–I think I have created a great replica (at a fraction of the cost, I might add)! You can’t beat (haha) roasted red and golden beet salad with a few other crunchy fixings–very satisfying and totally delicious. 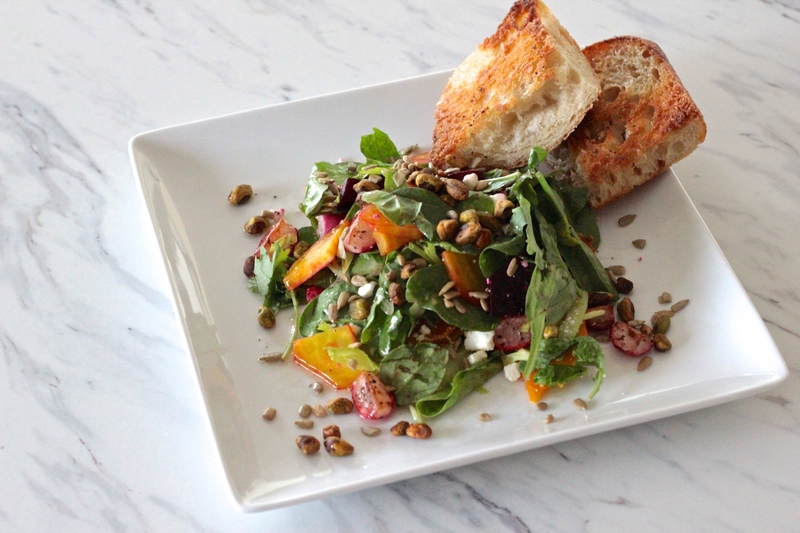 I had radishes on hand for this salad and thought I’d try pan-roasting them–it was amazing! They were sweet, not the usual peppery bite of a radish, and the texture was like a pan-roasted potato, minus the starch. The restaurant topped their salad with a perfect little lemon panna cotta; I topped mine with a simple lemon vinaigrette. As a side note, I remember the first time I ate beets–I was in Brazil and the region I was in had this sort of potato salad with cubed beets in it. Not the typical American potato salad you’re thinking of, loaded with mayonnaise. It’s just cubed potatoes and hard-boiled eggs and beets, maybe some peas, all sort of steamed together, no dressing, really. The beets were from a can, so they had this tinned pickled flavor, and although I didn’t dislike the flavor, it was just a new flavor and…interesting. But it wasn’t a roasted beet. Now roasted beets, that’s a whole ‘nuther story, I have since learned. I love roasting vegetables–they give a more rounded, deeper, and fuller flavor when you add roasted veggies to soups, sauces, dishes, etc. Roasting brings out the sweetness in a vegetable. And beets, that maybe smelled or tasted a little like dirt before being roasted, turn into these deep ruby red and golden gems of sweet earthiness. 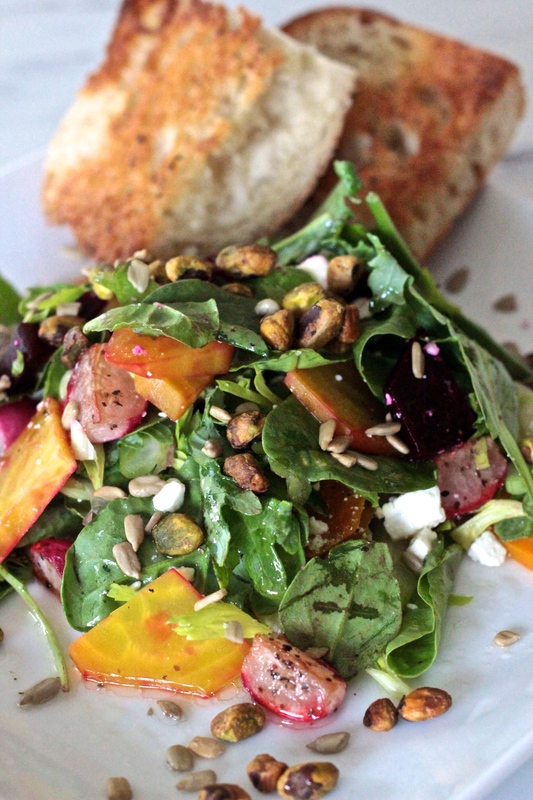 Although your (my) kids may not eat beets and greens, this salad definitely ensures your husband will! Preheat the oven to 400 degrees. Prepare the beets by washing them clean, then place–whole and unpeeled–in a bowl and drizzle a couple tablespoons of olive oil and season with salt and pepper. Place on a shallow roasting pan. Roast in the oven for about one hour, or until soft/firm (not mushy) when poked with a knife. While the beets are cooling, heat a saute pan with a tablespoon or two of olive oil over medium heat. Season the quartered radishes with salt and pepper and pan-roast them, stirring on occasion so they don’t burn, until their whites turn golden brown. Once the beets are cooled, peel and cut them into cubes or triangles–whatever shape you think will make your salad taste better. If you are going to cut the beets on the same cutting board, you might want to do the golden beet first, as the red beet will stain whatever comes after it. Place the remaining ingredients, the sliced celery through mixed greens, in a large bowl, add the pan-roasted radishes and the beets, and gently hand toss. Place on your serving dish. Whisk all the ingredients for the vinaigrette and spoon overtop the salad.